UNIFY Team does the site survey and checks the feasibility for Solar project. Our team also involves in liasoning activities with various Government and Discom’s department for approvals and other statutory compliances. 1. Shadow test: To collect maximum sunlightduring the day, the solar PV panel should face as much south as possible. Therooftop must be checked for the shadows of trees or adjoining builds etc.,particularly from south direction. 4. Locationof Equipment: Where do we locate the Balance of Systemcomponents? Ex: Inverter, DC Combiner box, AC Distribution Box, Batteries, ifrequired. 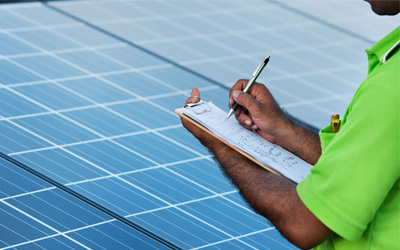 UNIFY’s Engineering division provide Solar PV Design and Drawing Services. We offered complete detail engineering services for Solar power projects.